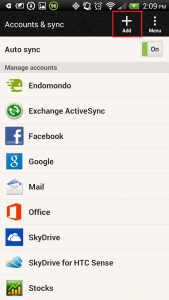 Email clients and mobile devices hosted on exchange, how are they configured? Firstly, if you use an email with Exchange and wish to configure (PC, Mac, mobile devices) with this article may set in a few minutes. This way you can work comfortably, sending and receiving emails from any device. 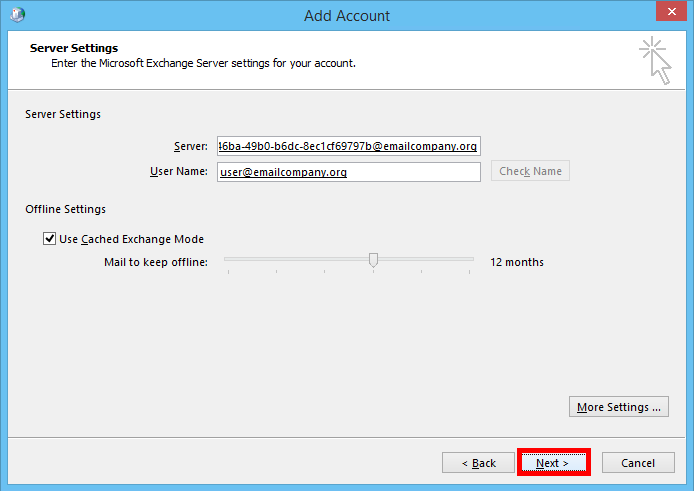 To begin, this article describes how to setup your Microsoft Exchange 2013 mailbox to work with your Microsoft Outlook 2013 email client. 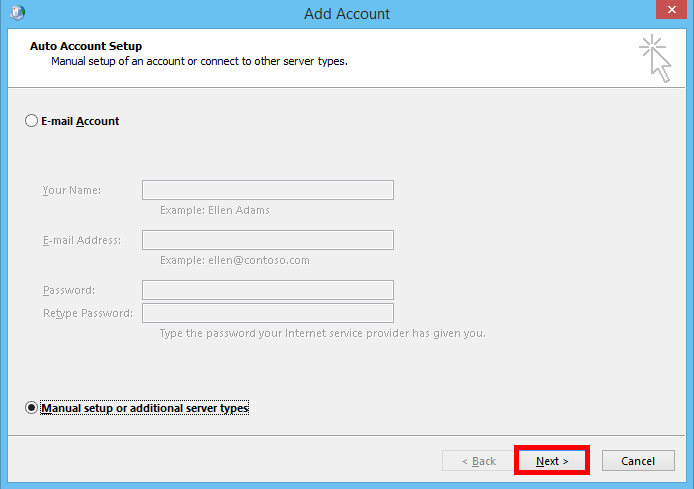 Please select Manually configure server settings or additional server types, and then click Next. 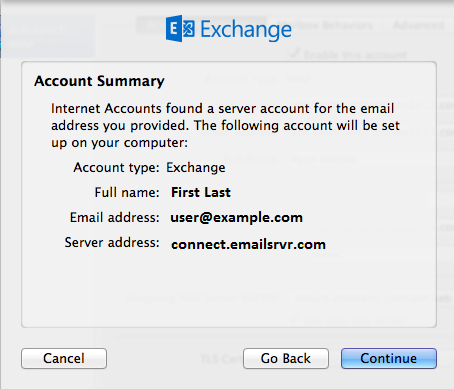 Then, select Microsoft Exchange or compatible service, and then click Next. In the Server text box, type outlook. 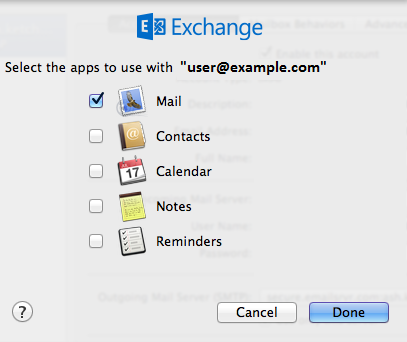 Select the the Use Cached Exchange Mode check box. In the User Name text box, enter your entire email address. 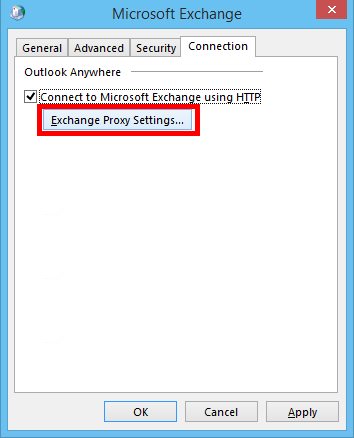 In the Microsoft Exchange dialog box, click the Connection tab and select the Connect to Microsoft Exchange using HTTP check box. 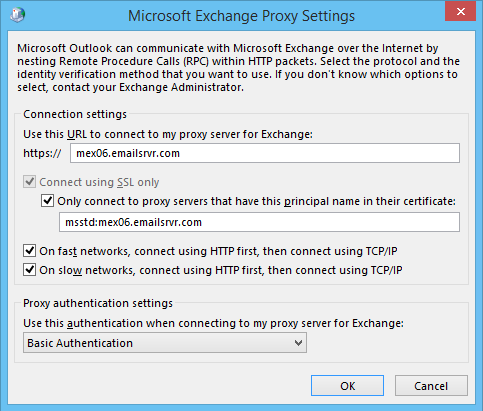 Then click Exchange Proxy Settings. In the Use this URL to connect to my proxy server for Exchange text box, enter mex06.emailsrvr.com. On the Server Settings page, click Check Name, type your password, and then click OK.Your name will then be highlighted and a line will appear under the User Name field, indicating that your profile has been configured. Click Next. On the next page, click Finish. 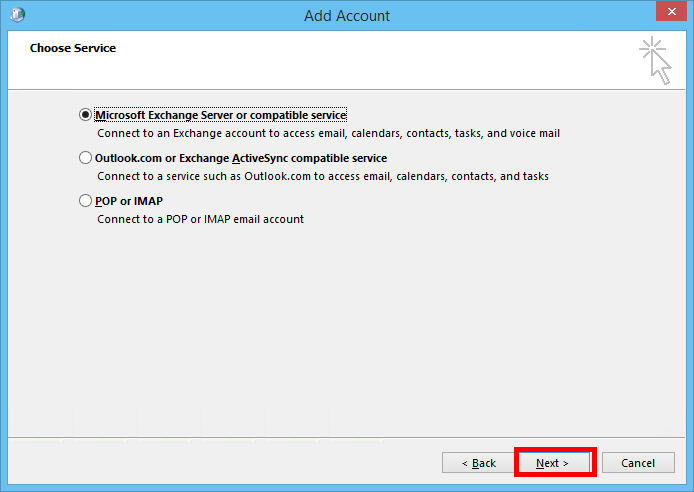 Open Outlook to select your new Exchange profile. 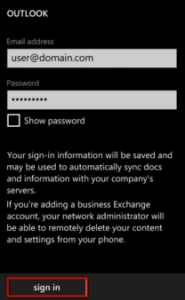 You have successfully added your Exchange email account on your Windows device. Launch System Preferences. You can easily get to System Preferences by pressing “Command (⌘) + Space Bar“. Then type “System Preferences” in the Spotlight search. Press enter to launch the System Preferences application. Within System Preferences, click “Internet Accounts“. Then select “Exchange“. “Name“: Enter your first and last name. “Password“: Enter your mailbox password. If “Internal URL” and “External URL” appears, enter “https://mex09.emailsrvr.com/EWS/Exchange.asmx” (without quotes) in both Internal URL and External URL. Then click the “Continue” button once more. Select “Continue” once more. 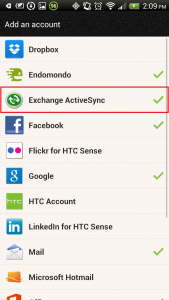 Then select the apps you would like to sync with Exchange. Finally, launch Mail. Your email should begin downloading shortly. 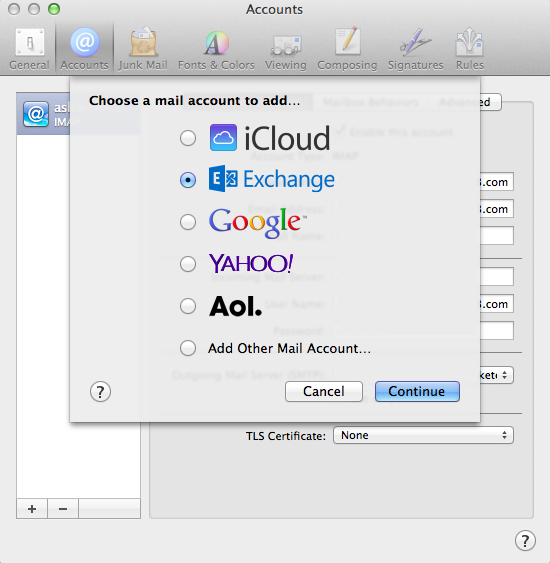 You have successfully added your Exchange email account on your Mac Os. 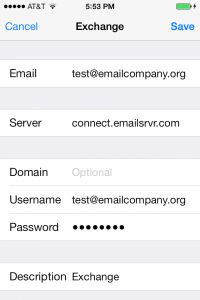 On the server settings page, tap the Server field and enter mex06.emailsrvr.com. Leave the Domain field blank. Then click Next. 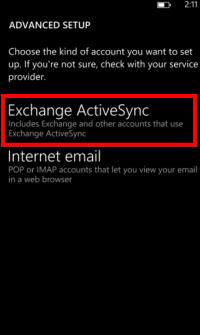 Select the services that you want to synchronize from the Exchange server. Then tap Save. 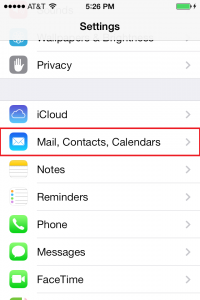 You have successfully added your Exchange email account on your iOS device. 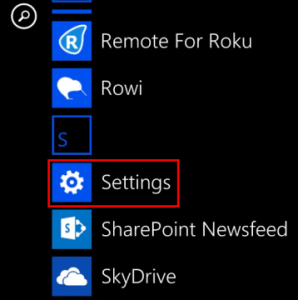 On your device, tap on the system Settings icon. Select Exchange ActiveSync (Microsoft Exchange ActiveSync on some devices). Username: Your email address again. 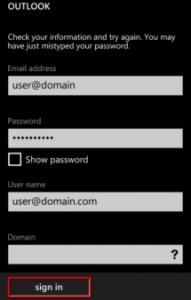 Some devices might combine the domain and username the settings as domain\username. 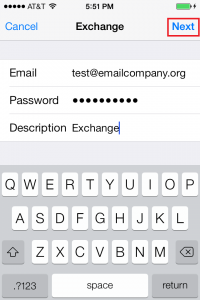 On those devices, precede your email address with a backslash (for example, \test@emailcompany.org). Password: Password for you email address. If you are prompted to enable remote security administration, tap OK or Allow. 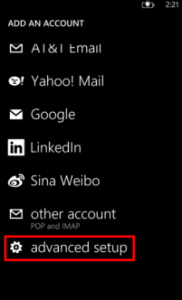 This setting enables you to remotely perform a factory reset (delete all data) on the device from the Outlook Web App (OWA) if the device is lost or stolen. Enter your full email address and password for your account, then press the sign in button. Click the Windows Start button, select Control Panel, and then click Mail (32-bit). Please, select Manually configure server settings or additional server types, and then click Next. 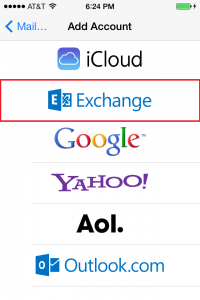 Choose Microsoft Exchange or compatible service, and then click Next. 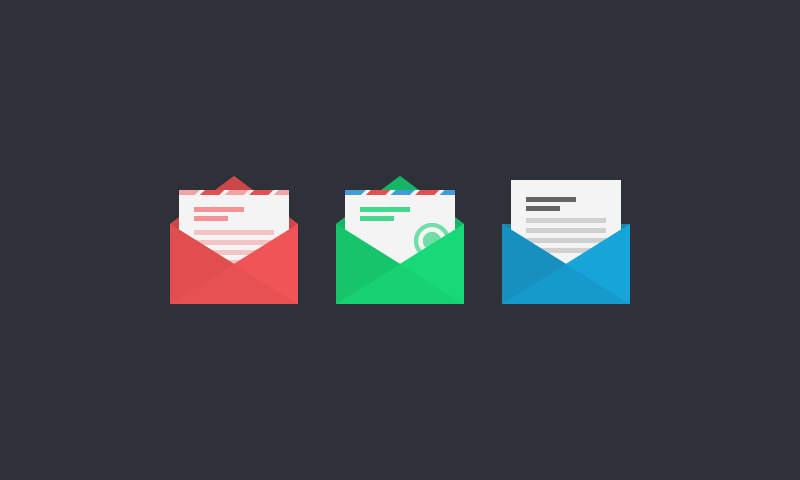 Open Mac Mail and select Mail > Preferences. In the new window that appears, click the Accounts tab in the top menu bar and then click the plus (+) symbol in the lower-left corner. Select Exchange and then click Continue. On the next page, enter your full name and your entire Microsoft Exchange email address and password. 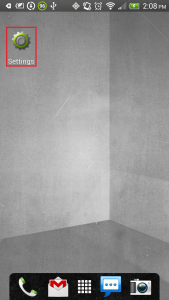 Then click Continue. 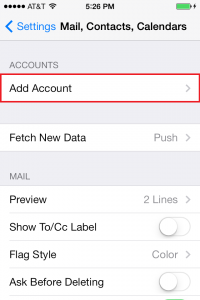 If your Autodiscover CNAME record is set correctly, Mail automatically pulls the correct server settings for you. Skip to Step 6. If the Autodiscover CNAME record is not set correctly, you can set up the account manually. Continue to Step 5. Enter the following information and then click Continue:Description – Enter a descriptive name for your mail account (for example, Work Mail). 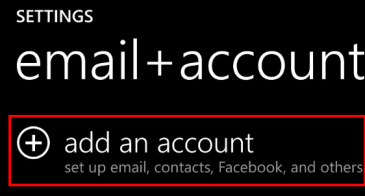 User Name – Enter your entire email address (for example, user@example.com). Password – Enter the password associated with the email account you are setting up. 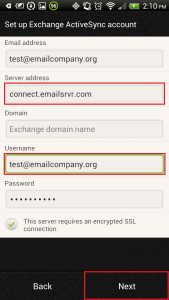 Server Address – Enter connect.emailsrvr.com. Confirm the settings and then click Continue. Choose any other options that you want to enable, and then click Done. 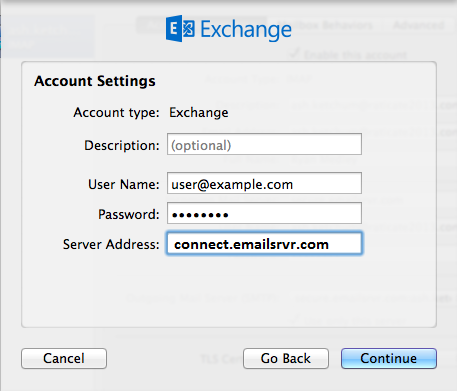 Your Microsoft Exchange 2010 email account is now set up with Mac Mail. 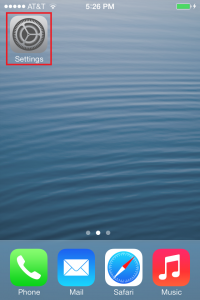 On the home screen of your phone, tap Settings. 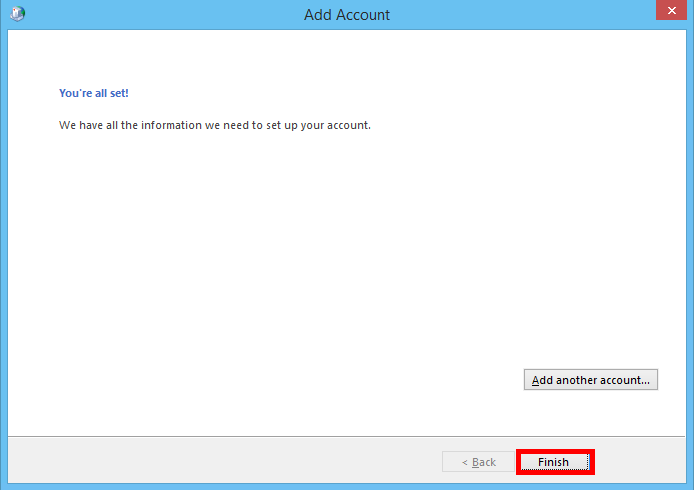 Enter your email address and password, and add a description of the account you are setting up. Then, tap Next. Email – Enter your email address. Domain – Leave this field blank. Username – Verify that your user name is exactly the same as your full email address. Password – Enter your email account password. Description – Enter a description of the account that you are setting up. This can be anything that helps you identify your account. Your device creates a secure (SSL) connection to the Exchange server. When the device is connected, check marks appear confirming that your settings have been verified. 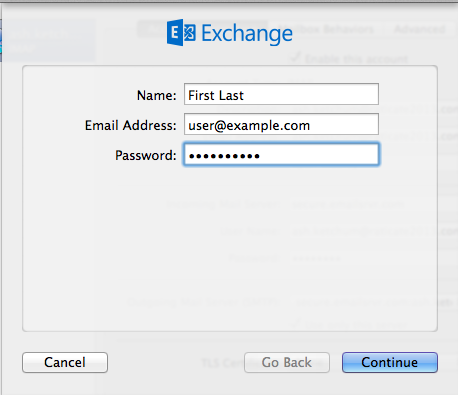 Select the services that you want to sync with the Exchange Server by swiping the ON/OFF buttons next to each service. Tap Save when you are done. 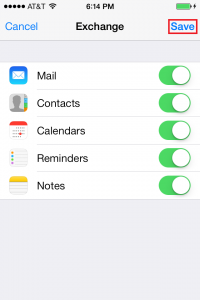 Tap the Settings icon, and then tap Accounts and Sync. 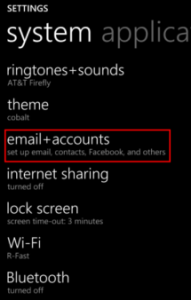 Tap the Add icon, and then tap Exchange ActiveSync. Email address: Enter your email address (for example, test@example.org). Username: Enter your email address again. Some devices might have the settings as domain\username. 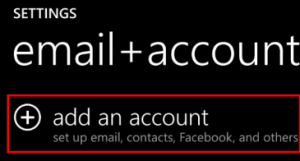 On those devices, the field should have a backslash (\) before your email address (for example, \test@example.org). 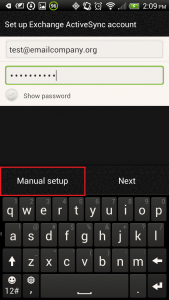 If you are prompted to enable remote security administration, tap Ok or Allow. 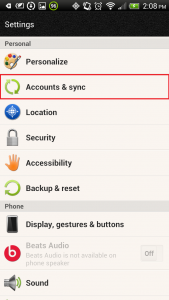 This allows you to remotely perform a factory reset (delete all data) on the device from Outlook Web App if the phone is lost or stolen and there is sensitive company information on the device. Select the services that you want to synchronize with the Exchange server and when to synchronize. Then, tap Next. 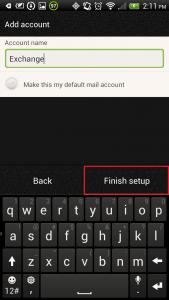 Enter a descriptive name for your account and then tap Finish setup. 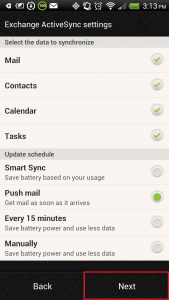 Your Android phone and Microsoft Exchange account are now synchronized. Then, please select Exchange ActiveSync. Ensure your email address remains correct. Also leave the Domain field blank. Enter the following address for Server: connect.emailsrvr.com. Consequently, select the sign in button. 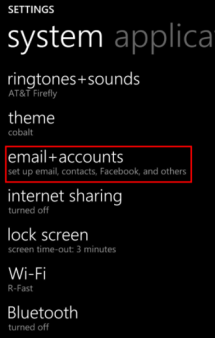 Once connected, you will see a new icon within your settings menu with the name of your new email account.